Marian Goodman Gallery is pleased to announce a new exhibition by Lothar Baumgarten, which will open on Wednesday, April 23 and be on view through Saturday, June 14. Baumgarten has developed a diverse yet consistent body of work over the last four decades, which is centered on ethnography and anthropology. ‘Los Aristócratas de la Selva y la Reina de Castilla’ is a work in progress, of several different components, within the existing architectural conditions of the exhibition space. At the center of the presentation are four ship models at a scale of 1:20. One coca, two caravels, the ‘Pinta’ and the ‘Niña’, which would use Latin sails until reaching Tenerife where it would change to square sails to pass the ocean sea, beside the vessel ‘Santa María’. 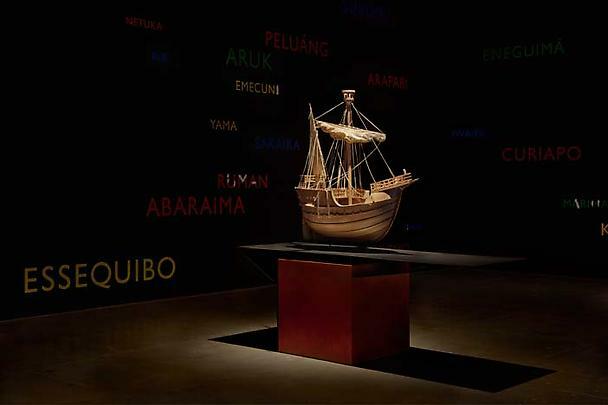 The ship models signify through their magnificent manufacturing the highly sophisticated nautical technology and engineering at the time of the last Discovery of the Américas. The ‘Santa María’, originally built from wood of the Cantabrian forests, emphasizes the great maritime culture of this rough coast in northern Spain. 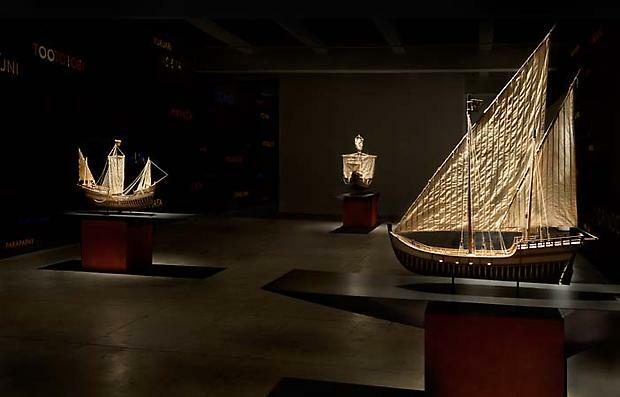 The boats rest on metal cantilevers, representing the waves of the ‘Ocean Sea’ they would sail. The ‘Santa Maria’ was owned and navigated by Juan de la Cosa, who was also the creator of the first map of the newly found lands in the West and taken into possession by Christofero Columbo. The gallery’s columns and the bases for the ships are hand-stained with Onoto seeds (Bixa orellana L.), a plant source used for body paint by most South and Central American native peoples - a common practice that mistakenly led, early on, to the name ‘Red Skin’. This vibrant natural pigment and its aroma, beside white downs from the chests of falcons and eagles on the painted names of the rivers, refer in this context to the animistic beliefs of Amerindian societies. The white ceiling beams of the architectural space stand out and mirror the frame structure of the ships. The center of the exhibition transforms into the inner sections of a ship itself. It also represents the central plaza of a native house: shapono, maloka, or churuata etc., as a sheltered world, mirroring the surrounding tropical cosmos and its equatorial firmament, mutating into a zone and a space of contemplation. Through its multi-layered discourse, the surrounding score of native river names represents the widely varying and rapidly vanishing languages of the non-writing societies - among them, the Pemón (Arekuna, Taurepan, Kamarakoto, Ingariko), Ye´ kuana, Hoti, Panare, Piaroa, Warao, Arawak, Sanema, Yãnomãmɨ, Baré, Makú, Wapishana, Makushi, Wai Wai… Surrounding the ships, the canon of the native river names develops and stands out within the dark infinity of the black surface. The configuration of names follows a geographical order and linguistic parameters. They are phonetically composed and in their playful flow are mapping time as a typographical landscape, the topographical watershed of the Guayana shield in Venezuela, Brazil, British and French Guyana, and Suriname. The archaic melody of native place names and the remains of their many languages will only survive in our maps. At the entrance are two maps; the map on the left shows the northeast area of South America in the seventeenth century [Partie de Terre Ferme ou font Gviane et Caribane, Nicolas Sanson, Paris, 1656]. The map on the right represents the tribal and linguistic distributions of the South American continent before 1492; these native tongues continue to disappear since western scientific linear thinking has taken over. This landscape is expanded by a further dimension: that of sound. Accompanied in intervals by the music of ‘Luces y Sombras en el tiempo de la primera gran Reina del Renacimiento’, by Jordi Savall, the sound of the Caribbean sea, the ambient sound of the tropical forest beside the wayamou and hekuramou rituals of the Yãnomãmɨ a soundtrack of eight hours permeates the exhibition space. This mental space is embraced by the screening of six ethnographic film fragments (108 minutes) in various locations. The unedited material for this projection was selected from nine hours of 16 millimeter film footage and seventy-four hours of sound, converted to video, recorded while I lived among the Yãnomãmɨ people at the Alto Orinoco in Venezuela and Brazil for an uninterrupted period of eighteen months in 1978-80. Their endangered culture is present in this documentary portrait of the last days before disintegration into misery in recent decades. The architectural parcours of the presentation and the layout of the wood and steel bases for the ship models, as well as the supervision of their construction, was conceived in collaboration with Lorenzo Piqueras architect-museographer, Paris. Digital Mastering by Paul Geluso, New York. Music by Jordi Savall, interpreter and director, Isabel I, Reina de Castilla ‘Luces y Sombras en el tiempo de la primera gran Reina del Renacimiento 1451-1504’ HESPÈRION XXI. Ship models by Adrían Prada, Orienta Si and Cesc Riera. Steel work by John Milich, Product And Design, New York. Optil ® Mineral Paint, true matte black, courtesy of KEIM Mineral Coatings of America, Inc.
Lothar Baumgarten represented Germany at the 41st Venice Biennale in 1984, where his work was awarded the Golden Lion. His work has also been shown at documenta 5 (1972), 7 (1982), 9 (1992), and 10 (1997). Recent solo exhibitions include Los Aristócratas de la Selva y la Reina de Castilla, Fundación Botín, Santander (2012), Evening of Time, Señores Naturales, Yãnomãmɨ, Museum Folkwang, Essen (2011), Seven Sounds / Seven Circles, Kunsthaus Bregenz, Austria (2009), Autofocus Retina, Museu d’Art Contemporani de Barcelona (MACBA), Spain (2008), and Imago Mundi, Museum Kurhaus, Kleve (2006). His work is currently included in the 1st International Biennial of Contemporary Art of Cartagena de Indias and Lens-based Sculpture at the Akademie der Künste, Berlin through April, and in Booster: Kunst Sound Machine at Marta Herford, Germany, through June 1st. Other recent group exhibitions include Ends of the Earth, Land Art to 1974, Haus der Kunst, Munich, (2013); Estado Oculto, curated by Rodrigo Moura in dialogue with Paulo Maia, 43rd Salón Nacional de Artistas, Medellín, Colombia (2013); Neunzehnhundertsiebzig. Material, Orte, Denkprozesse, Kunstmuseum Luzern, Luzern, Switzerland (2013); Ends of the Earth, Land Art to 1974, The Museum of Contemporary Art, Los Angeles (2012); Oltre il muro, Castello di Rivoli Museo d'Arte Contemporanea, Turin, Italy (2012); and MMK 1991-2011: 20 Jahre Gegenwart, the Museum fur Moderne Kunst, Frankfurt (2011); La Triennale, Palais de Tokyo, Paris (2012); Spies in the house of Art, Metropolitan Museum of Art, New York (2012); and Minimal Resistance, Reina Sofia, Madrid (2013). Recent publications include Lothar Baumgarten: Tortugo, Los Aristócratas de la Selva y la Reina de Castilla (2012) which was published in conjunction with his solo exhibition at the Fundación Botín, Santander; Seven Sounds / Seven Circles (2009) CD album and catalogue published on occasion of his show at the Kunsthaus Bregenz, and Autofocus Retina, published for the exhibition at MACBA in 2008. Please join us at the opening reception for the artist on Wednesday, April 23rd, from 6-8 pm.